Hawaiian Airlines today announced it will begin daily nonstop flights between Sacramento (SMF) and Kahului, Maui (OGG) next year, offering convenient, direct access to the Valley Isle on the airline’s new Airbus A321neo from California’s capital city. Hawaiian, Hawai’i’s largest and longest-serving carrier, launched its Sacramento–Honolulu service in June 2002. The carrier currently operates four Airbus A321neos on the following routes: Portland and Honolulu and Kahului, Maui; San Diego and Kahului, Maui; and Long Beach and Honolulu. The highly efficient, mid-range A321neo aircraft complement Hawaiian’s fleet of wide-body aircraft currently used for service between Hawai’i and 12 U.S. gateway cities, along with 10 international destinations. Hawaiian’s 189-passenger A321neo includes 16 luxurious leather recliners in First Class, 44 Extra Comfort premium economy seats, and 129 Economy seats. In addition to Hawaiian’s warm hospitality, including complimentary meals, guests will enjoy wireless streaming in-flight entertainment, access to USB outlets, and additional overhead stowage space. 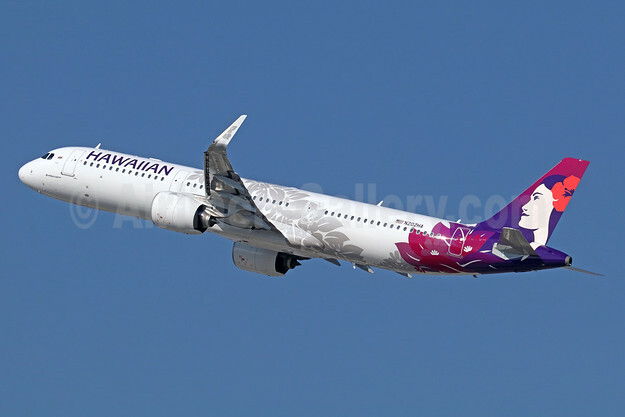 Copyright Photo (all others by Hawaiian): Hawaiian Airlines Airbus A321-271N WL N202HA (msn 7917) LAX (Michael B. Ing). Image: 940199. This entry was posted in Hawaiian Airlines and tagged Airbus A321-271N WL, Hawaiian Airlines, msn 7917, N202HA on June 29, 2018 by Bruce Drum. Hawaiian Airlines is expanding Airbus A321 coverage as more aircraft are delivered. In other news, on April 12, the airline celebrated its 10-year anniversary of service between Oakland and the Hawaiian Islands. Guests boarding the airline’s flights from Oakland International Airport (OAK) to Honolulu and Maui were treated to Hawaiian music, hula, and 250 bonus HawaiianMiles offered by its World Elite Mastercard program. Hawai‘i’s flagship carrier first introduced its authentic Hawaiian hospitality to Bay Area travelers in 1986 when it launched service at San Francisco International Airport. Hawaiian expanded operations in 2005 with flights at San Jose International Airport, followed by OAK in the spring of 2008. In the past decade, Hawaiian has carried more than 1.5 million guests on over 6,000 flights departing OAK toward Hawai‘i, with nonstop service to Honolulu and Maui, as well as seasonal service to Līhu‘e on Kaua‘i and Kona on the Island of Hawai‘i. In January, the airline introduced its new Airbus A321neo aircraft on its Oakland to Maui route. Starting July 15, 2018 Hawaiian will launch nonstop service between OAK and Kaua‘i operated by the A321neo. Copyright Photo: Hawaiian Airlines Airbus A321-271N WL N202HA (msn 7917) LAX (Michael B. Ing). Image: 940198. This entry was posted in Hawaiian Airlines and tagged Airbus A321-271N WL, Hawaiian Airlines, msn 7917, N202HA on April 18, 2018 by Bruce Drum. 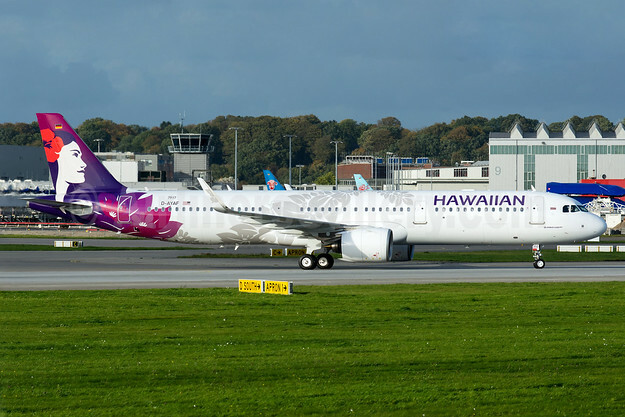 Hawaiian Airlines has announced it has removed two seasonal summer flights between the Bay Area and Hawai‘i from its schedule and deferred another due to unforeseen delays in the delivery of the carrier’s new Airbus A321neo fleet. Due to the delays, Hawaiian will no longer offer two seasonal summer flights between the Bay Area and Hawai‘i. Our previously announced extra flight between San Francisco and Honolulu, and the flight between Oakland and Kona will be removed. Service between Oakland and Lihue, originally scheduled to commence on April 11, will be deferred until July 15. Guests already booked on these flights will be re-accommodated on other Hawaiian Airlines flights from the Bay Area to their final destination. *Dates not shown in the above table are currently in the process of being re-accommodated. This entry was posted in Hawaiian Airlines and tagged Airbus A321-271N WL, Hawaiian Airlines, msn 7917, N202HA on March 2, 2018 by Bruce Drum. 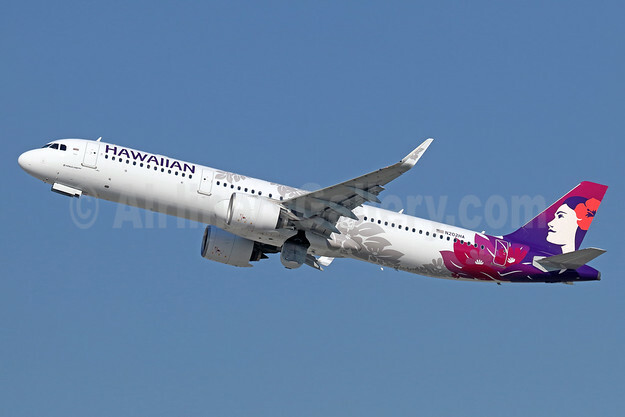 Hawaiian Airlines (Honolulu) will add a new Airbus A321neo connecting its Honolulu hib with Long Beach, CA. The new route will commence on May 31, 2018 per Airline Route. Top Copyright Photo (call others by Hawaiian): Hawaiian Airlines Airbus A321-271N WL N202HA (msn 7917) LAX (Michael B. Ing). Image: 940200. This entry was posted in Hawaiian Airlines and tagged Airbus A321-271N WL, Hawaiian Airlines, LAX, msn 7917, N202HA on January 8, 2018 by Bruce Drum. Hawaiian Airlines is adding additional service to the San Francsico Bay for the next summer season. The carrier will add a second daily flight on the Honolulu – San Francisco with the new Airbus A321neo starting on May 25, 2018 per Airline Route. The airline is also starting Kona – Oakland service starting on May 26, 2018 also operated by the new Airbus A321neo. The first Airbus A321neo was at Los Angeles on December 6, 2017 on a route proving flight (pictured). A321 service to the Mainland starts in 2018. In other news, Hawaiian is adding a second daily flight on the Honolulu – Tokyo (Narita) route commencing on August 1, 2018. This entry was posted in Hawaiian Airlines and tagged Airbus A321-271N WL, Hawaiian Airlines, LAX, msn 7917, N202HA on December 7, 2017 by Bruce Drum. Hawaiian Airlines, the only U.S. carrier to offer travelers complimentary meals on all transpacific flights for over three decades, is cooking up something new. Hawai‘i’s hometown carrier will introduce new elements in both food and fashion tomorrow by launching a new meal program for its North American routes while debuting uniforms by local designer Sig Zane across its network. Guests in the main cabin on Hawaiian flights between Hawaii and Western U.S. gateway cities will be treated to complimentary meal service exclusively created for the airline’s new Pau Hāna Café brand. The new service, based on guest feedback, is being launched in preparation for the roll-out of Hawaiian’s new fleet of Airbus A321neo aircraft early next year. The Pau Hāna Café, branded meals made exclusively for the airline, consists of a continental breakfast box for brunch and hot sandwich and side for lunch. Pau Hāna, a Hawaiian term for “finished work,” is a time to relax and unwind after a long workday. The meal service will be followed by coffee and a sweet treat for dessert. A parting Mahalo service features the carrier’s popular Koloa Breeze cocktail, featuring Koloa Rum from the Island of Kauaʻi, and our signature Pau Hāna snack mix (above). As Main Cabin guests enjoy The Pau Hāna Café, the airline’s extremely well-received Featured Chef Series overseen by Hawaiian Airlines Executive Chef Chai Chaowasaree will remain in place for First Class guests traveling from Hawaii to North America. Hawaiian also welcomed its newest Featured Chef, Wade Ueoka of MW Restaurant. Chef Wade’s meal cycle runs through June 2018 and includes island-inspired dishes such as a cold tofu salad with kimchee, watercress, kaiware sprouts, yuzu kosho vinaigrette appetizer and a ground beef and Portuguese sausage meatloaf with home-style gravy, sautéed mushrooms, potatoes and kale entree. The updated meal program coincides with the debut of new uniforms for over 5,000 of Hawaiian’s front-line staff globally. The pieces by Hilo-based designer Sig Zane were unveiled during last year’s HONOLULU Fashion Week as employees from Airport Customer Service, Cabin Service, Cargo, In-Flight, Line Service, Maintenance, Ramp, and Supply walked the runway. The print’s theme, Kū Mākou, or Together We Stand, is represented by the lehua blossom and ‘ohe kapala (bamboo stamps) through every piece of each work group’s uniform, as applied in different scales and tonalities to prints, linings and woven elements. In related news, Hawaiian Airlines will now introduce the new Airbus A321neo into revenue service on December 19, 2017 between Honolulu and Kona as flight HA118 per Airline Route. In January the airline will introduce the new type to the Mainland with Kahului – Oakland (January 8, 2018) and Kahului – Portland, OR (January 18, 2018). Top Copyright Photo (all others by Hawaiian): Hawaiian Airlines Airbus A321-271N WL D-AYAF (N202HA) (msn 7917) XFW (Gerd Beilfuss). Image: 939629. This entry was posted in Hawaiian Airlines and tagged Airbus A321-271N WL, D-AYAF, Hawaiian Airlines, msn 7917, N202HA, XFW on December 4, 2017 by Bruce Drum. Hawaiian Airlines on November 16, 2017 welcomed to Honolulu the first of 18 Airbus A321neo aircraft (A321-271N N202HA, msn 7917) that will shortly begin flying between Hawai‘i and the U.S. West Coast. The company’s new fleet of single-aisle aircraft will offer guests non-stop flights to more islands, starting with service to Kaua‘i, Maui, and the Kona Coast on the Island of Hawai‘i. Hawaiian held a blessing ceremony for its first A321neo, “Maile,” named after a vine native to Hawaii and traditionally used for lei making and celebrations. Fittingly, Hawaiian’s A321neo is adorned with a new livery featuring a silver maile lei wrapping around the fuselage as the carrier’s “Flower of the Sky” Pualani icon gazes forward from the tail of the aircraft. Hawaiian’s inaugural A321neo flight is scheduled for January 8, 2018 on the carrier’s existing Kahului-Oakland route. New A321neo service between Kahului and Portland will launch on January 18, 2018. Hawaiian’s seasonal summer wide-body service currently offered between Līhu‘e and Oakland will resume April 11, 2018 as a daily A321neo flight. Daily service between Kona and Los Angeles launches March 11, 2018 with wide-body aircraft before converting to the A321neo in the summer. The mid-range A321neo aircraft will complement Hawaiian’s fleet of long-haul, twin-aisle aircraft used for service between Hawai‘i and 11 U.S. gateway cities, along with 10 international destinations. The airline’s narrow-body Boeing 717 fleet offers approximately 170 flights between the Hawaiian Islands. The 189-passenger aircraft includes 16 luxurious leather recliners in the Premium Cabin, 45 Extra Comfort premium economy seats, and 128 Economy seats. Textiles and other materials throughout the cabin pay homage to traditional Hawaiian crafts such as bark cloth (kapa) and fishing nets. Other details range from sand-inspired wall panels to Hawaiian language signage and LED mood-lighting evoking Hawaii’s soothing sunrises and sunsets. Guests will enjoy access to wireless streaming entertainment, USB outlets, and additional overhead stowage space. Powered by Pratt & Whitney PurePowerr® Geared Turbofan™ (GTF) engines and incorporating the latest in aerodynamics, the A321neo is the quietest and most fuel efficient aircraft in its class, leading to 16 percent lower fuel burn and carbon emissions over previous generation aircraft. Hawaiian’s A321neo flight deck features next-generation communication, navigation and surveillance avionics – including a completely digital low-range altimeter, and transponders and multi-mode receivers that are fully compliant with future airspace mandates – from Rockwell Collins, a pioneer in innovative aviation solutions. The aircraft also benefits from the company’s MultiScan™ ThreatTrack weather radar, which alerts flight crews of potentially disruptive weather, allowing for smoother flights and more on-time arrivals. In other news, Hawaiian Airlines also announced the planned retirement of Mark Dunkerley, president and chief executive officer (center above), and the selection of Peter Ingram, executive vice president and chief commercial officer, to replace Dunkerley, effective March 1, 2018. Dunkerley’s departure will end 15 years of leadership during which the company executed a remarkable turnaround to become one of the world’s most successful airlines. During Dunkerley’s tenure, Hawaiian Airlines successfully embarked on a bold Asia-Pacific growth strategy, adding service to Tokyo, Osaka and Sapporo, Japan; Seoul, South Korea; and Beijing, China as well as new routes to Auckland, New Zealand; Sydney and Brisbane, Australia; and New York City. Since December 2002 Hawaiian has doubled the number of passengers flown annually, to 11 million. Over the same period the company’s gross revenues have increased four-fold, to $2.64 billion and its employee count has doubled, to 6,600. Its share price has risen from a 52-week low of 29 cents in 2003 to a high of $60.90 over the last 52-week period. Ingram joined Hawaiian as chief financial officer in December 2005, six months after its emergence from Chapter 11 Reorganization. In 2011, Ingram became chief commercial officer, overseeing marketing and sales, revenue management and network planning, loyalty programs and cargo during a period of rapid revenue growth for Hawaiian. All photos by Hawaiian Airlines. This entry was posted in Hawaiian Airlines and tagged A321-271N, Airbus A321neo, Hawaiian Airlines, msn 7917, N202HA on November 16, 2017 by Bruce Drum.